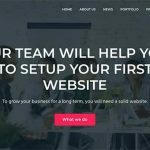 Create WordPress website 2018 on SiteGround with Genesis theme today. From scratch step by step video tutorial for beginners. Build WordPress website 2018 easy video tutorial. Bonus: HTTPS and SEO steps included!